Swedish software studio Digital Illusions CE (DICE) may be most famous for its Battlefield series of games, but the studio has produced everything from pinball simulators to platform games since its inception in 1992. In 2002 the studio was commissioned to produce a driving game for the new Microsoft Xbox console and the PC. The result was Rallisport Challenge, a superbly playable rally simulator that still looks and plays fantastically well more than a decade later. Featuring Rally, Hillclimb, Ice Racing and Rallycross, you’ll need all your skill and concentration to complete the career mode and become the world rally champion. The game should install without any issues on a modern PC. Simply insert the first disc and follow all on-screen prompts. We recommend that you do a full installation for best performance. Unusually for a PC game there are no patches to install, so simply start the game from your Start menu or Start screen when installation is complete. We recommend disabling any secondary monitors, if attached, before starting the game. RalliSport Challenge uses SafeDisc copy protection, which is unfortunately incompatible with Windows 10. To play the game on your Windows 10 PC, you must find a cracked or hacked executable file. Unfortunately due to copyright law we cannot link to files like this, even for old games. The cracked executable file we used was by the notorious hacking group Deviance and its MD5 value was 67B2C8943DBBB67F259EF1140E52EE0F. When running the game in Windows 10 we found that our mouse moved erratically over the screen. Fortunately it is possible to select all the games options using the keyboard, so mouse control is not needed. There are several graphics related settings you may wish to configure before hitting the road. To do so, start the game and choose “Start Game” from the main menu. Create a profile if necessary or choose an existing one. Now, select “Options” from the main menu and then select “Display Options”. Now, select “Graphics setup”. A screen will now appear allowing you to change various visual settings. The top sliding control will allow you to adjust the games resolution. The highest value you can set this to without resorting to hacking is 1280×1024. Below this option there is the option to change “Gamma”. Adjust this control if the image appears too bright or too dark. Again, anyone with a modern PC should be able to turn all of these options on or set them to their highest setting (as shown in the picture) without negatively affecting the games performance. 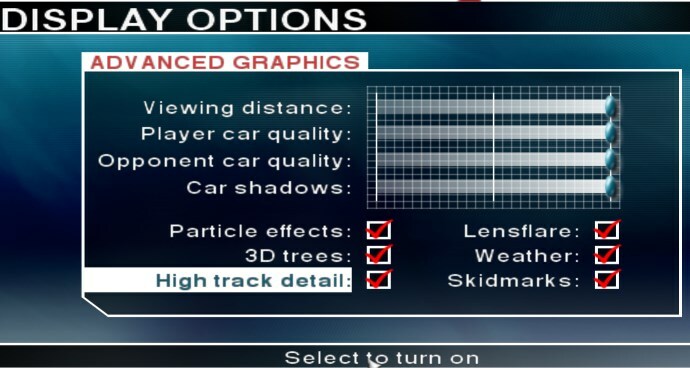 If you find that the game doesn’t run smoothly, come back to these options and choose the “High” graphics detail instead. Finally, if you own a Nvidia or ATI graphics card, you may see a small improvement in the games visuals by using the software that comes with your card to apply antialiasing. This will make the edges of the cars in the game look slightly smoother, though it is only a small gain in quality at best. Configure your graphics card software to override the games default antialiasing settings, then choose the highest available antialiasing option. Nvidia users can find the antialiasing settings by opening the Nvidia Control Panel and clicking on “Manage 3D Settings”. ATI users can find the settings in the Catalyst Control Center by clicking on “Gaming” and then “3D Application Settings”. Consult your graphics card manufacturers website if you need more information or help with this. Sound options for Rallisport Challenge can be found in the same sub-menu as the display options. Again, start the game and choose or create a profile, then select “Options” from the games main menu and then choose “Sound Options”. On the menu that now appears, you can change the sound quality to “High” and set car sounds to “All cars” for best results. Doppler effects (which relates to how sound appears to change as you move past an object) can be enabled or disabled to taste. Like many older games, Rallisport Challenge also supports hardware accelerated audio. Since support for hardware accelerated audio was removed in Windows Vista, this option will not be available when running the game on modern versions of Windows. If you have an EAX capable sound card in your system, you can use the Creative ALchemy software to restore hardware accelerated audio capability to this game in modern versions of Windows. Simply exit the game and start the ALchemy tool. On the main ALchemy window, click on “Add”. Enter the name of the game in the Game Title box (Rallisport Challenge) and then choose the “Use Game Path” option and browse to the Rallisport Challenge game folder (C:\Program Files (x86)\Microsoft Games\RalliSport Challenge by default). Leave all the other options as the defaults and click on “OK”. Finally, choose “RalliSport Challenge” from the list on the left of the ALchemy window and click on the “>>” button. The game should now appear on the list of “ALchemy-enabled Games” on the right. With ALchemy enabled, you can start Rallisport Challenge again and go back into the sound options. You will now be able to enable hardware acceleration. In practice this didn’t seem to make any difference to the sound quality and it’s entirely possible this option was available simply to take the burden of audio decoding away from the CPU, rather than to add any enhancements to the games sound. Rallisport Challenge has native support for racing wheels, gamepads and joysticks. As per usual we’ll take a look at what it takes to configure the Xbox 360 controller for use in the game. Controllers can be set up by going to the games main menu, choosing “Options” and then “Controller settings”. On the window that then appears, you can select between the three different types of controller. To use a 360 controller, choose the gamepad option. You should increase the “dead zone” setting at least 2 notches from the lowest setting, more if the car feels too twitchy. This configuration simply allows the d-pad to navigate the games menus, while the A button confirms a choice and the back button goes back up to the previous menu. 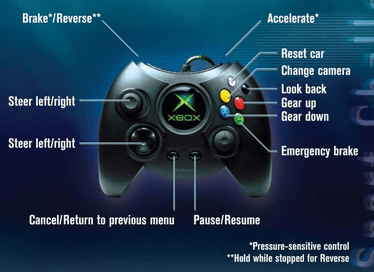 Remember that on the Xbox 360 controller, the analogue triggers are mapped to the same axis, so it’s impossible to perform advanced driving manoeuvres which require you to use the accelerator and brake at the same time. In order to fix this problem, we’re going to need another tool called XInput Plus. 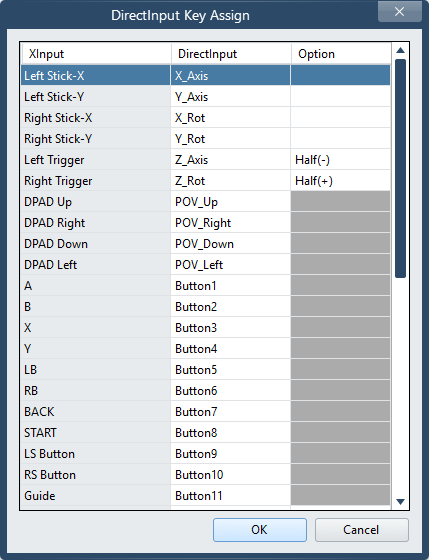 XInput Plus is a neat little tool that lets you reconfigure/re-map your game controller to suit the control schemes in older games. Before Microsoft standardised the PC gamepad, there were hundreds of different controllers, which inevitably lead to certain controllers only working in certain games. 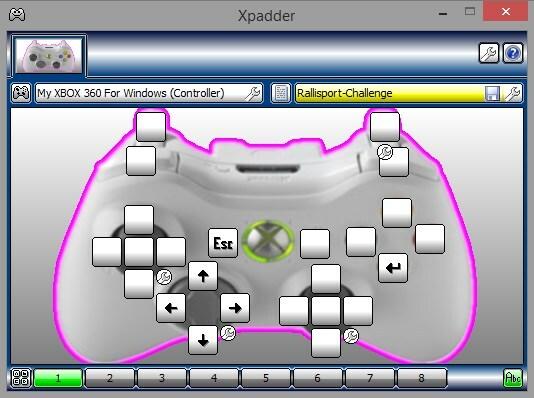 Using this tool, we can re-map the controls on our control pad to suit the game. Start by setting up Xinput Plus by following the tutorial here. Set the game directory to Rallisport Challenge. Now, in Xinput Plus, select the DirectInput tab and then click on the “Customize” button. Now, assign “Left Trigger” to “Z_Axis” and set the option to “Half (-)” and “Right Trigger” to “Z_Rot” and set the option to “Half (+)”. Your Xinput Plus window should then look like the window shown below. Click on “OK”. 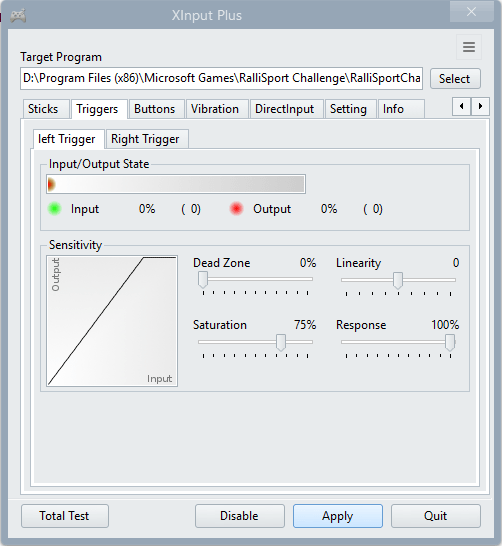 This is the very minimum you need to do to get the analogue triggers working, but with this configuration you will probably find that the dead zone (the amount that you have to squeeze the trigger before you get any response) is too high. To fix this, select the “Triggers” tab. Now, for both the left and right trigger, ensure that “Dead Zone” is set to 0% and that “Saturation” is set to 75%. Finally, click on Apply. You can now start Rallisport Challenge again. Don’t forget to go into the control options again and redefine the accelerator/brake controls. You should also set the dead zone for the triggers in-game to 0. If you still find the dead zone is too great, come back to Xinput Plus and decrease the Saturation setting for both triggers again. Although there is no support for widescreen play in Rallisport Challenge, it is possible to play in widescreen by hacking the games executable file. Unfortunately, in order to do this you will need a ‘cracked’ version of the game with the original copy protection removed. Due to site policies we cannot provide links or downloads for this kind of file. If you are able to obtain an unprotected version of the game, you must use a hex editing tool to change the contents of the executable file. See this article on the Widescreen gaming forum for details. We can confirm that this technique works, always back up your files before you attempt to edit them like this as one mistake can render the game unplayable. Rallisport Challenge has support for multiplayer games over the internet and the local network. Sadly, we weren’t able to get this option to work on our Windows 8 PC. Attempting to host a game simply gave a “server not found” error. If anyone has a workaround to this problem please let us know in the comments. The popular gaming utility Evolve supports Rallisport Challenge, allowing you to take screenshots and videos as well as chat to your friends and browse the web all without having to leave the game. If you need to backup your game profile/save game data you can find the files at the following path – C:\Users\(your username)\AppData\Local\VirtualStore\ProgramData\Microsoft\RalliSport Challenge.